I was born in Lower Austria's Weinviertel - in the midst of vineyards, so to speak. My father worked for decades at a large winery. As a child, I helped regularly with the grape harvest. These were the first impulses to engage in wine. However, I initially went into the then still young electronic data processing (EDP) and then worked for 35 years in a computer service operation for banks and savings banks in the areas of data center, internal audit, training and process organization as a manager. During this time, I also led several major projects in the areas of corporate merger, rationalization, process organization and change management. Only relatively late did I come to the wine. In the early 1990s, I was invited to a wine tasting, where I tried around ten varieties under expert guidance with the necessary explanations. It was the first time I had the experience that you can enjoy wine not only with the palate and the tongue, but also with the nose and eyes. This positive experience aroused my interest and I began to intensively - both practically and theoretically - to deal with the "divine drink". After a few wine seminars, around 100 read books on wine, visits to tastings, fairs and wine events and last but not least practical cooperation in vineyards and cellars of winemaker friends, the first glossary with around 800 keywords. 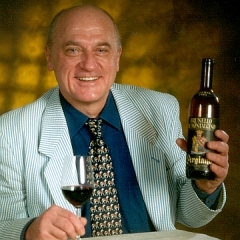 This was offered in 1999 to Utz Graafmann, who had recently gone online with his wine website "Wein-Plus". This began a fruitful collaboration that continues to this day. Follow me on Facebook and learn exciting and surprising facts about wine!. The Wein-Plus Wine Glossary is the world's largest online wine knowledge database with 22,529 keywords. There are about 1 700 grape varieties, over 2,000 wineries with farm descriptions, over 10,000 different vineyard, wine and vinification terms, about 100 countries with their history of wine, their wine regions, grape varieties, wineries and wines, more than 600 biographies of famous people and all important wine law concerns described. Since 1999, with 800 keywords at the time, it has grown 25 times. The glossary is a "living" piece of work, as users' daily comments are taken into account, which means that it is constantly adapted to their needs. For a work of this scope, the question inevitably arises of how to find the information you need the fastest and how to get an overview of the content. In this regard, a detailed description under the keyword Wein-Glossaryincluded. Martin Adler, Wilhelm Amort, Wolfram Armbruster, Gertrud Bachmann, Alfred Bachmayr, Karl Bajano (vulgo „Koal“), Christiane Barth, Andreas Becker, Steffen Becker, Bernd Beckschwarte, Andreas Beer, Walter Bernhaupt, Peter Berns, Manfred Bohn, Ewald Briesch, Johannes B. Bucej, Dirk Boujong, Patrick Bous, Dietmar Bruckner, Joachim Buchta, Eduardo Capurro, Lars Dalgaard, Ivan Dramlitsch, Ingo Drescher, Brigitte Engelmann, Axel Finger, Rudi Finkler, Friedrich Fischer, Manfred A. Fischer, Friedhelm Fritsch, Jürgen W. Fritz, Alex Fromm, Peter Gebler, Helmut Gidl, Karl-Heinz Gierling, Hans-Wilhelm Grabbe, Christian Graf, Björn Gülsdorff, Johann Gutauer, Klaus-Dieter Gwiasda, Andreas Haeger, Karl Heblich, Andreas Heller, Max Hendlmaier, Sybille Herbst, Horst Hermann, Helmut Herrmann, Gert Hiller, Sigbert Hiss, Rudolf Hutterer, Reimer J. Huy, Andreas Jung, Günter Junker, Peter Junker, Joachim Kaiser, Walter Kaltzin, Stefan Keller, Deborah Keser, Achim Kirchner, Karsten Kirsch, Klaus Klein, Bernd Klingenbrunn, Tomaz Klipsteter, Wolfgang Klug, Helmut O. Knall (vulgo „Knalli“), Frank Kobus, Jürgen Krüger, Bettina Lander, Anton Landort, Florian Lauer, Giuseppe Lauria, Mari Lax-Hoffmann, Edmund Lemperle, Joachim Lorenz, Elmar M. Lorey, Florence Ludi, Udo Ludwig, Moritz Lüke, Ute Mangold, Andreas März, Johannes Mißlbeck, Salvador Montenegro, Wolfgang Mucher, Jochen Müller, Matthias Neske, Siegfried Nowak, Thomas P. Offner, Stelios Paltatzidis, Herbert Patrak, Gerhard Paul, Michael Petz, Gerhard Präsent, Michael Pronay, Torsten Rahn, Ferdinand Regner, Jörg und Rita Reidlinger, Frank Rembold, Simone Renth-Queins, Steven Richter-McAulay, Thomas Riedl, Frank Röder, Dieter Sagolla, Fritz Sahli, Walter Salzbrunn, Henry Sams, Werner Saumweber, Stefan Schäfer (vulgo „Weinschaf“), Joe Scherer, Sven Schiffmann, Frank Schindler, Oliver Schmidt, Ralf Scholze, Bernhard Seeber, Christian Seegers (vulgo „Weinnase“), Daniel Senn, Thomas Sommer, Frank Stehr, Jürgen Steinmeyer, Verena Suratny, Ricardo Tognella, Tobias Treppenhauer, Dietrich Treusch, Claudine Villetet, Darius Voisiat, Walter Waimann, Cornelia Wehrmann, Carolin Werner, Ruedi Wildbolz, Janina Wilsch, Herbert Friedrich Witzel, Jeffrey Wolff, Dominik Ziller (vulgo „Bonner Reblaus“). The sources include well over 100 different works. Among them, almost all well-known authors are represented. Weinrecht in Deutschland – Weingesetz, Weinverordnung u.a. Österreichischer Agrarverlag Druck- und Verlags-Ges.m.b.H.